Wikis are widely used in blended learning educational settings with varying degrees of success. 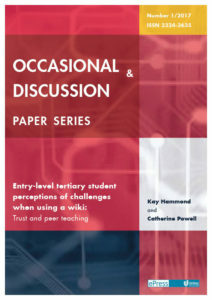 Scholarly attention increasingly regards student perceptions and experiences of using wikis as part of ongoing development. Students in entry-level education often belong to high-needs target groups who particularly require positive experiences for successful transition into tertiary education. This paper reports action research exploring the use of a wiki by certificate-level students at a tertiary institution. The results showed most students did not engage with the wiki. Qualitative student feedback revealed valuable insight into two major social challenges when interacting online: trust and difficulties with peer-teaching. Recommendations are made regarding these social challenges that should be considered by educators aiming to use a wiki or other collaborative online learning and teaching spaces for entry-level education.